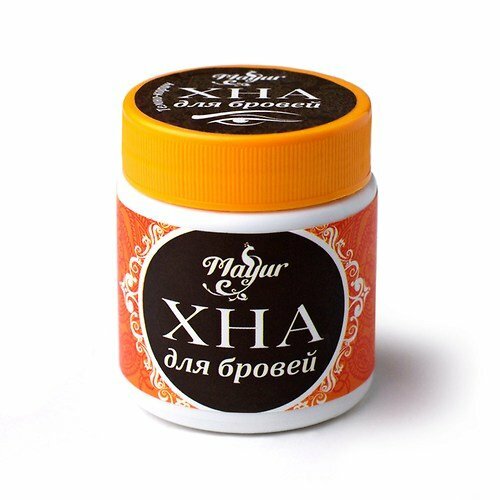 Dark Brown Henna Eyebrow Tint by Ukrainian beauty brand Mayur is a natural product that will give your eyebrows a deep natural colour and keep them well-groomed. Formulated with Ayurvedic herbs imported from India. Approved and certified by the Ministry of Health of Ukraine. The plant Lawsonia inermis, commonly known as henna, has long been used to dye hair and eyebrows. Dried and powdered henna leaves contain natural pigment that is naturally reddish in colour but it can be mixed with other natural ingredients like indigo of saffron for other shades. Henna-based eyebrow tint is a semi-permanent dye that is safe even for those who have sensitive skin or are allergic to hydrogen peroxide and other chemical dye ingredients. Dark Brown Henna Eyebrow Tint is based on a blend of Ayurvedic herbs (henna, bibhitaki, bhringraj, haritaki, gotu kola) that will dye your eyebrows dark brown, helping to emphasize their shape. When applied correctly, henna tint lasts for up to 14 days (due to the rapid eyebrow growth/shed cycle). All this time, you won’t need to use brow pencil and make-up to make your eyebrows look naturally well-groomed. You will need only a small amount of henna powder to tint your eyebrows, so even a 25 g jar will last several months, helping to save your budget. Directions. Mix a small amount of powder with warm water to obtain a thick, lump-free paste. To protect your skin from pigment, apply some Vaseline or thick cream around the perimeter of your eyebrows. Apply paste to eyebrows with a thin brush and leave for 30 minutes. Wipe with a damp cotton pad. Do a patch test before use to avoid any unexpected allergic reaction. Ingredients. Lawsonia Inermis (Henna) Powder, Eclipta Prostrata (Bhringraj) Leaf Powder, Centella Asiatica (Gotu Kola), Terminalia Chebula (Haritaki), Terminalia Bellirica (Bibhitaki), Sodium Perborate, Citric Acid, p-Phenylenediamine, 4-Aminophenol, Natural Minerals, Natural Thickener. Want to buy Dark Brown Henna Eyebrow Tint? Call us or submit your order via our web site! Biofarma is a Ukrainian cosmetic distributor and manufacturer that specialises in Ayurvedic personal care products. Founded in 2006, it is an exclusive Ukrainian distributor of several Indian companies, including Zee Laboratories Ltd, Marico Ltd, and Vedicare Ayurveda Pvt Ltd. The company cooperates with the leading Ukrainian wholesale cosmetic distributors, retail chains and beauty salons, as well as actively participates in various international exhibitions and festivals. Along with importing Ayruvedic cosmetics and selling them to Ukrainian consumers, Biofarma has also launched its own cosmetic brand, Mayur. Biofarma’s own products branded as Mayur include henna powder and henna-based hair dyes and eyebrow tints, unrefined coconut oil, flower waters (herbal distillates), skin and hair care products, and more. All these products are based on natural ingredients imported from India and certified by the Ukrainian Ministry of Health.